It's February and MS. 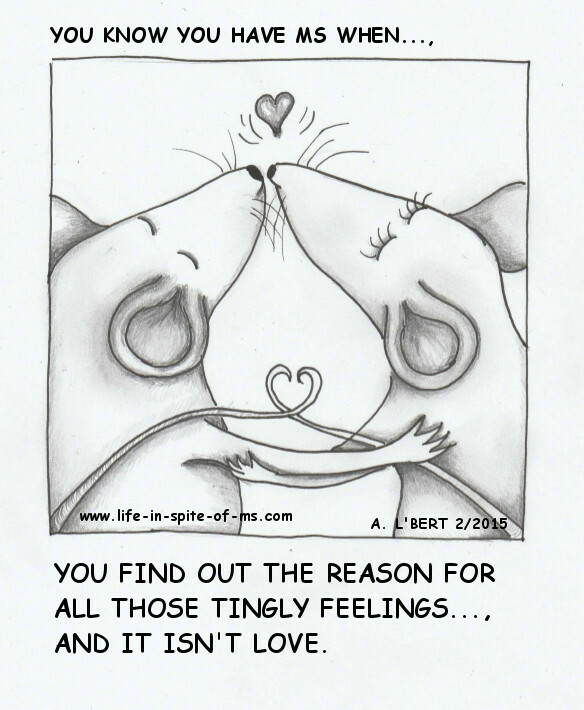 Mouse is feeling love in the air (and in her body). She's been feeling all tingly and knows for sure it's because her Boo has been extra generous with his gifts of dark chocolate and kisses for one her favorite holidays, Valentine's Day. At her doctor's appointment, she mentioned it and found out to her surprise that maybe the tingly feelings weren't due to love, but to multiple sclerosis. It's with great surprise that I write this note to you today. I just found out some news that I'd like to share with you, in case you are having the same feelings. My Boo has been showering me with gifts of dark chocolate, cute fluffy animals, and of course lots of kisses. (It is almost Valentine's Day you know.) I'm sure many of you probably get all tingly when things like this happen, too. Well anyway, I had a doctor's appointment the other day and guess what? After mentioning my warm and fuzzy tingly feelings, she said that they were a common MS symptom. Imagine that! Although, I have to admit, they weren't always warm and fuzzy. Sometimes I would rather they would just go away, especially when they were annoying and (I must admit) at times even painful. Everyone loves to feel warm and tingly - sometimes. Right? But as I'm sure you will agree, there's a limit to how much one can take. Hmmm, I guess that means I'll have to take a closer look at some of the other feelings I've been having. Maybe they're an MS symptom, too. Just thought you'd like to know, in case you have been having the same experience. Oh well, that's all for now. I hope you enjoyed this months cartoon - MS Mouse 2 - 2015. Come back next month for another one of her fun and witty notes (along with another cartoon), about how MS Mouse is dealing with multiple sclerosis. If you like what you see, leave a comment below. She loves reading them and will sometimes comment back when she has something witty to say. Feel free to Pin, Share, and Tweet this page to your MS family and friends.